Integr8tor automates data entry and design analysis in a pre-CAM environment to obtain faster and more accurate information for quoting and product engineering. It delivers complete CAM data right at the start of the tooling process. Access INTEGR8TOR from anywhere on the network, inside or outside the company, in sales, engineering,CAM, the shop floor and at your customer. Organized information at your fingertips: a clear queue with filters shows the status of all jobs, and drills down for details of the selected one. Jobs are submitted the moment they enter your company for fastest response times. The workflow system processes work in background and notifies the users when it is done or when it needs some assistance. Built-in rule-based algorithms automate standard routine tasks. A powerful scripting language automates your custom routine tasks. 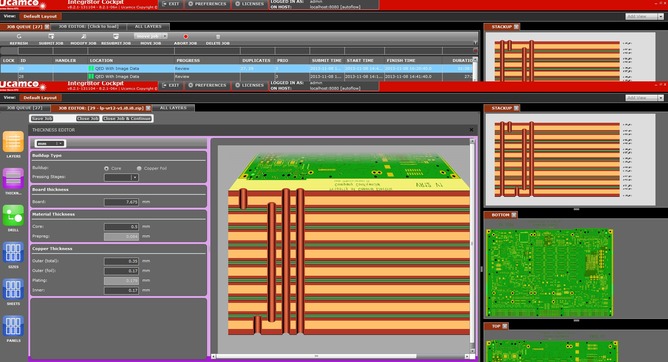 A simple and intuitive user interfaces makes the system and easy to learn and accessible to all– not only for CAM engineers. When you receive an order, Integr8tor immediately calculates the full set of process parameter without the need to wait for CAM – providing accurate and comprehensive information related to your capability classes. Review critical locations efficiently with the dedicated Checkpoint review tool. By planning earlier, you gain time for time-critical jobs. By planning smarter, you minimize shop-floor downtime and increase effective plant capacity. Quoting imposes a hard choice on the PCB fabricator. Use your CAM system, and you have wasted valuable CAM resources if you miss the order. Do not use it, and you might miss process-critical details. Damned if you do, damned if you don’t. Integr8tor provides the way out. It automatically calculates a detailed report on all process-critical parameters, in minutes. Quotes are both accurate and fast. Users report quoting time cut by 50%. Faster quotes result in more orders. Better quotes result in better margins. Customers respect the fast, clear and accurate feedback on any design or DFM issues. This is provided by Integr8tor analysis and Checkpoint, its capability-based graphical DFM review tool. Integr8tor is important in generating new business. 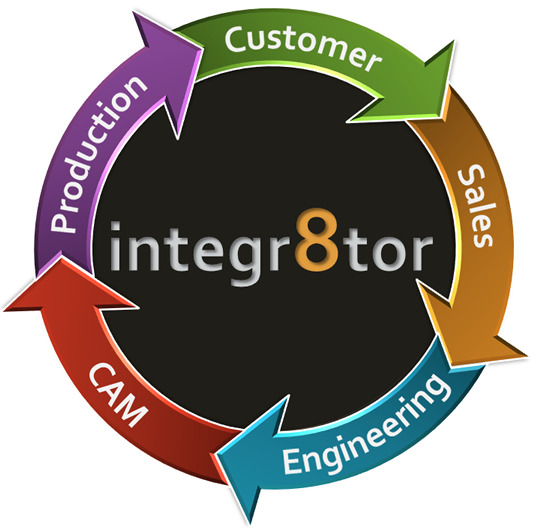 Integr8tor automates the routine CAM work, freeing up valuable CAM engineers for value-added tasks. Integr8tor users report up to 30% savings in CAM time and costs. XML files and Integr8tor database access integrate seamlessly with third party ERP, CRM, CIM and engineering systems to further streamline your workflow. Smooth job exchange between Integr8tor and any CAM system, Ucamco, Orbotech, CAM-350… streamline your whole front-end operation.